President and CEO of Direct Relief International, Thomas Tighe, in a provocative piece of video describing the unsavory relationship between international NGO’s and the U.S. Government – specifically that of USAID (the US Agency for International Development). The organizations only get funding according the their acquiescence to the government’s terms and conditions. Therefore, the ‘beneficent’ relationship is inextricably linked to the criteria of Western imperialism. In 1995, self-sufficient Eritrea, another target of US destabilization, also expelled USAID in order to protect and build Eritrean autonomy. “According to a 1973 document revealed in the Family Jewels CIA documents, around 700 police officers were trained a year (by the Office of Public Safety), including in handling of explosives,” Wikipedia summarizes. “The United States has a long history of providing police aid to Latin American countries. In the 1960s the U.S. Agency for International Development’s (USAID) Office of Public Safety (OPS) provided Latin American police forces with millions of dollars worth of weapons and trained thousands of Latin American police officers. In the late 1960s, such programs came under media and congressional scrutiny because the U.S.-provided equipment and personnel were linked to cases of torture, murder and ‘disappearances’ in Argentina, Brazil, and Uruguay. +++Read the article in its entirety here. 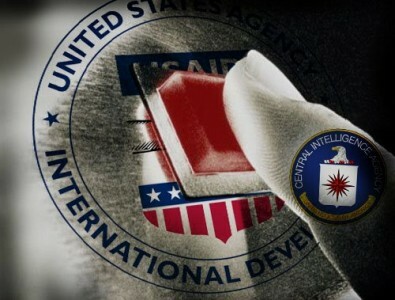 ISLAMABAD: The National Accountability Bureau has unofficially conveyed its apprehensions to some leading security agencies of the country that certain USAID officials, apparently monitoring and executing development work in the tribal areas and in Khyber Pakhtunkhwa, are spying for the CIA.